With the theme "Linking Practice, Evidence and Performance"
Read here and please add a comment. You can use our modest map below to get to Soba Teaching and Training Centre where the workshop will be held, or you can locate it using google maps. Looking forward to welcome you. In an interview with Find the Edge, Paul talks about the use of stories to bring about innovation in organisations. Although the target audience for this interview are readers of business news in general, and business leaders in particular, it may also be useful for innovation in the public sector as his ideas are more about "... bringing knowledge management to life!" Read / Listen to first part of the interview here. Healthcare is experiencing an exponential growth in the scientific understanding of diseases, treatments and approaches to care. As a consequence, healthcare knowledge is being generated at a rapid pace and its utilisation can profoundly impact patient care and health outcomes even when efficacy has been validated and has led to technical endorsement. However, this growth of knowledge is not going hand in hand with our ability to effectively disseminate, translate and apply current healthcare knowledge in clinical practice. In fact, the large volume of healthcare knowledge, dispersed across different mediums, is making it extremely difficult for healthcare professionals to be aware of and to apply relevant knowledge to make the ‘best’ patient care decisions. This workshop will focus on healthcare knowledge management, an emerging research theme that supports healthcare professionals in making high quality, well-informed and cost-effective patient care decisions. Knowledge management implemented well, promises ‘to transform the health care delivery system into a more cost-effective, error averse and accountable public resource’. The workshop will promote interdisciplinary approaches from public health and evidence-based medicine, rural development and pro-poor healthcare provision approaches, computer science and information systems, business, management and organization science, as well as provide a communication forum bringing together academia, non-governmental, public and private sectors, to investigate the application and impact of knowledge management practices in healthcare delivery; discuss the challenges faced by continuous learning in knowledge-intensive healthcare delivery organisations; and highlight knowledge management and knowledge management capacity as an opportunity for providing optimal, timely, effective and pragmatic healthcare knowledge to healthcare professionals, patients and individuals, where and when they need it, and as an approach for linking practice and evidence for performance improvement. Explore current issues and practices in knowledge management and their implications for public health in Sudan. Examine the fundamentals of knowledge management in the context of healthcare: Culture, Content, Process and Technology. Network with decision makers and change agents in knowledge management, public health and the wider community. What are the categories of knowledge and the nature of knowledge-intensive activities in healthcare; aspects of performance in healthcare delivery; social practices of knowledge acquisition and sharing; that are significant for improving health outcomes? Which challenges and opportunities in healthcare such as those related to knowledge content and capability transfer, performance results tracking mechanisms, technology and support infrastructure, healthcare structures and communities of practice, that have an impact on healthcare decision making? How can healthcare professionals tailor, use, and extend techniques and tools from knowledge management and organisational learning for improving their healthcare practices and processes? 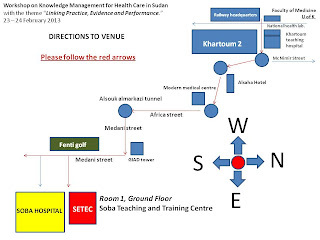 Keynote on “Knowledge and Health: Implications for Sudan”. Overview of the local public health system and relevant knowledge/information initiatives. Presentations from local case studies (more notably the Mycetoma Research Centre). Knowledge Cafes for thinking out of the box and thinking about the future. Software demonstrations (featuring open source knowledge management tools for health care). To attend the workshop, please fill this registration form. Because of limited spaces please only register if you will be attending at least one full workshop day. Participation in this workshop is free of charge. Paul J Corney is an advisor, coach and knowledge management practitioner. He is an early pioneer of intranets in the mid 90′s and one of the first ‘knowledge managers’ in the City of London I’ve led many challenging assignments, often cross culture, and frequently cross continent. I was a visiting lecturer on knowledge and information management at London Metropolitan University and have published numerous articles the most recent of which is featured in Making Knowledge Management Work for Your Organization published by Ark Group in 2012. I speak at and chair international events and run masterclasses. In 2013 I am again chairing KMUK, running a masterclass on knowledge retention in Singapore and helping the health industry in Sudan to share knowledge. Diplomacy intrigues me. I am a member of the Royal Institute for International Affairs (Chatham House) and the Institute of Directors. I’ve been the Chairman of Pyecombe Golf Club and the Manager of Hassocks Football Club both of which taught me the need for effective engagement. This blog was created by Gada Kadoda on 13 February 2013. Simple theme. Powered by Blogger.